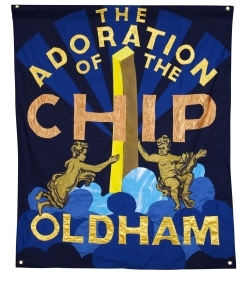 This permanent exhibition in Gallery 1 is home for objects from our collections that relate to the history of Oldham. 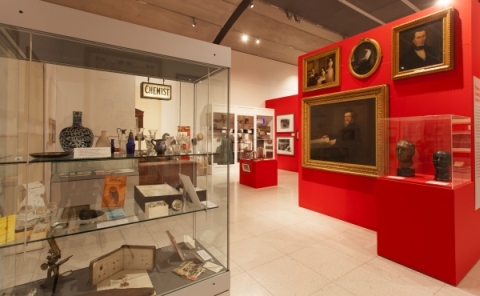 Here you can see some of our best-loved artefacts, alongside items that might surprise you. We bring together objects from our Natural History, Social History and Art Collections to look again at Oldham past and present. The display features local figures such as suffragette Annie Kenney, pioneering naturalist James Neild and popular artist Helen Bradley. It also explores the changing industrial and cultural landscape of the area. From birds and shells to archaeology and banners every object has a tale to tell. Oldham Stories includes some of our best paintings, including important watercolours from the Charles Lees Collection and paintings by artists who recorded local views and characters. Oldham Stories includes a range of family activities. You can follow our gallery trail, identify the smells in our Edwardian Chemist’s shop, create a fuzzy felt landscape for our owls and even make a badge as a souvenir of your visit.